Visit St. Kilda Beach and Cowes Beach for some beach relaxation. 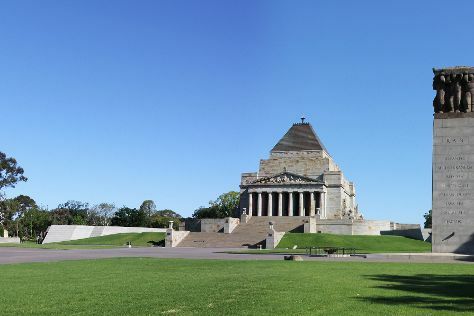 Get some cultural insight at Shrine of Remembrance and Old Melbourne Gaol. You'll find plenty of places to visit near Melbourne: Cowes (Koala Conservation Centre & Phillip Island Wildlife Park), McCrae Beach (in McCrae) and Sovereign Hill (in Ballarat). Spend the 6th (Sat) wandering through the wild on a nature and wildlife tour. The adventure continues: meet the residents at Melbourne Zoo, admire the natural beauty at Royal Botanic Gardens, explore the world behind art at National Gallery of Victoria, and wander the streets of Melbourne Central. To find ratings, where to stay, maps, and other tourist information, read Melbourne online driving holiday planner . If you are flying in from India, the closest major airport is Melbourne International Airport. In April, daytime highs in Melbourne are 23°C, while nighttime lows are 11°C. Finish your sightseeing early on the 13th (Sat) so you can travel back home.